LAS VEGAS – One of country music’s biggest new stars Maren Morris goes into this year’s ACM Awards with a win, as it was previously announced she received the New Female Artist of the Year honor. Fox News spoke with her ahead of the Academy of Country Music Awards in Las Vegas. Fox News: What has your success this year shown you? Maren Morris: I think things were getting a little homogenized, with just, it was a lot of guys and there weren't as many girls… I think that people were just dying to hear a female voice, like, intercut with all these guy songs and… more just diversity anyway…. I just feel like my timing was sort of at the time where everyone was having that conversation about like where are the women? And I feel like there's been a huge impact of women. There's Kelsea Ballerini, myself… Lauren Alaina, Raelynn, and there's been this influx of really amazing artists who happen to be women. I think I'm not really attached to the females in country conversation as much anymore but I think, you know, we're here to stay, and we've always been here, and we've always been good. Fox News: Helpful to go in already knowing you’ve won? Morris: Yeah, it definitely is an ice breaker going into the awards already having one, and it was just so crazy when I heard I did win because I was in London at the time, and we were doing a festival out there, and my manager was like “You just won an ACM.” And I was like “How?” It’s so early! But it was so cool, and then I was so proud of my friends Brothers Osborne and Jon Pardi for winning their first ACMs too. So I feel like we're all going to walk with our heads a little higher into the awards show. Fox News: And you have a collaboration at the ACMs as well (with Thomas Rhett). What do you feel it’s doing for the genre? Morris: …Performing with Thomas Rhett our song “Craving You,” I’m so excited for the fans to see it, and sort of see our worlds come together because I feel like he's sort of a genre pusher and boundary pusher, and I feel the same way about my music… It just seemed natural for us to do a song together at some point, and so I'm excited to debut it at the ACMs. Fox News: Touring wise, what you learned from this headlining tour? 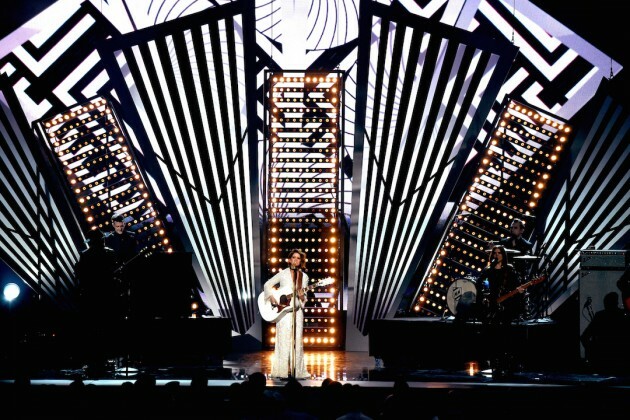 Maren Morris performed her single “I Could Use a Love Song” at the 2017 ACM Awards on Sunday night (April 2). The “Hero” singer also took time to thank a few country artists who helped her along the way, including “Little Big Town for taking me out on the road” and Keith Urban: “Thank you so much for believing in me,” she said. “I Could Use a Love Song” is the newest single off of Morris’ debut album, Hero; it’s the fourth track on the album and its third single, following the award-winning “My Church” and the retro-fueled “80s Mercedes.” Written by Morris, Laura Veltz and Jimmy Robbins, “I Could Use a Long Song” finds the singer feeling jaded and cynical about love, wishing that she could go back to a time when she was more hopeful. The singer adds her first ACM trophy to a growing list of accolades, including a 2017 Grammy Awards win for Best Country Solo Performance and a 2016 CMA Awards trophy for New Artist of the Year. Morris earned six nominations in four different categories at the 2017 ACM Awards: Female Vocalist of the Year, New Female Vocalist of the Year, Single Record of the Year (for her debut single, “My Church”) and Album of the Year, for Hero. Rhett was joined by Maren Morris for her second performance of the night. While their outfits contrasted one another (Morris donned a pink floor-length dress and Rhett went casual in a black bomber jacket and sneakers), their perfect voices complemented each other’s. 0 Response to "Maren Morris talks big year: 'I think that people were just dying to hear a female voice'"